Source: CICH graphic using data adapted from Statistics Canada, Canadian Centre for Justice Statistics, Uniform Crime Reporting Survey. http://www.statcan.gc.ca/pub/85-002-x/2015001/article/14211/tbl/tbl02a-eng.htm -accessed July 27, 2017. 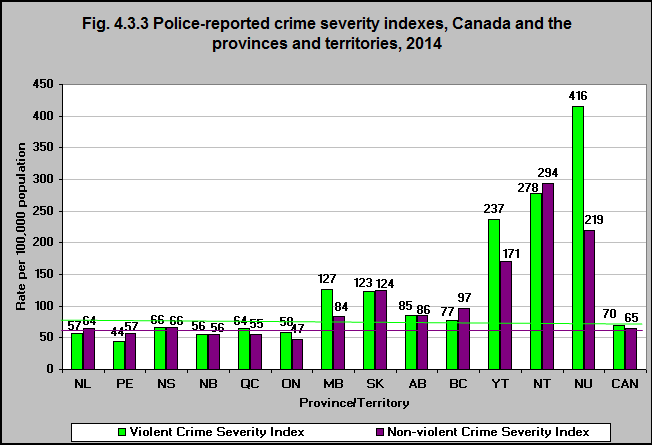 In 2014, the overall crime severity index varied between provinces and territories. Most provincial/territorial index numbers for violent and non-violent crime are similar except in the Yukon where violent crime is higher and in Nunavut where violent crime is almost double non-violent crime. 1Crime Severity Indexes are based on Criminal Code incidents, including traffic offences, as well as other federal statute violations. The base index was set at 100 for 2006 for Canada. Data on the Crime Severity Indexes are available beginning in 1998. Percent changes are based on unrounded rates. Populations are based upon July 1st estimates from Statistics Canada, Demography Division. The principle behind the Crime Severity Index was to have more serious crimes carry a higher weight than less serious crimes. As a result, changes in more serious crimes would have a greater impact on the Index than on the traditional crime rate. The overall Crime Severity Index includes all Criminal Code and federal statute offences. The Violent Crime Severity Index includes all violent offences, while the Non-violent Crime Severity Index includes everything that does not fall into the category of violent offences. http://www.statcan.gc.ca/pub/85-004-x/2009001/part-partie1-eng.htm-accessed July 27, 2017.